I do love a surprise gift, especially when it is packed full of yummy food and drink. While it may be a little early for me to start thinking about Christmas (I like to let the school summer holidays pass at least! ), the family behind Spicers of Hythe hampers are already putting together their plans for the bumper Christmas season. 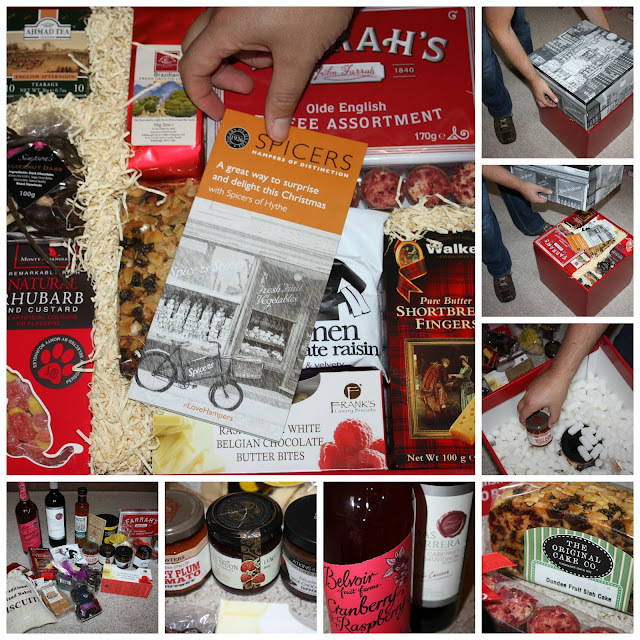 Spicers sent us a sample of one of their range of 55 Christmas hampers which they are planning for this festive season. This year they'll be sending out around 100,000 Christmas gourmet hampers. Opening up our hampers was a little bit like opening presents on Christmas day - hidden inside the box was an assortment of sweet and savoury treats as well as drinks (soft and alcoholic), cake, preserves and oils - lots of specialist products from small and large suppliers all over the UK. For us, our slightly-out-of-season Christmas hamper was a wonderful surprise and perfectly timed so that we could take lots of the treats with us on our self-catering holiday. From jam for breakfast to wine with dinner and a sneaky chocolate afterwards! We even took our bag of luxury lemon biscuits with us on a family hike in the lake district to keep us going when we needed fuel to inspire the girls to keep on walking. Its a lovely selection to suit lots of different tastes.